One of my major regret with carrying my iPhone 7 on travel is, it’s battery life. I like to watch movies, TV shows or listen to music but this puts a significant dent on the battery while travelling. If you are like me, you would be looking into a way to expand the battery life and Battery Case for iPhone 7 is a nice way to do it. 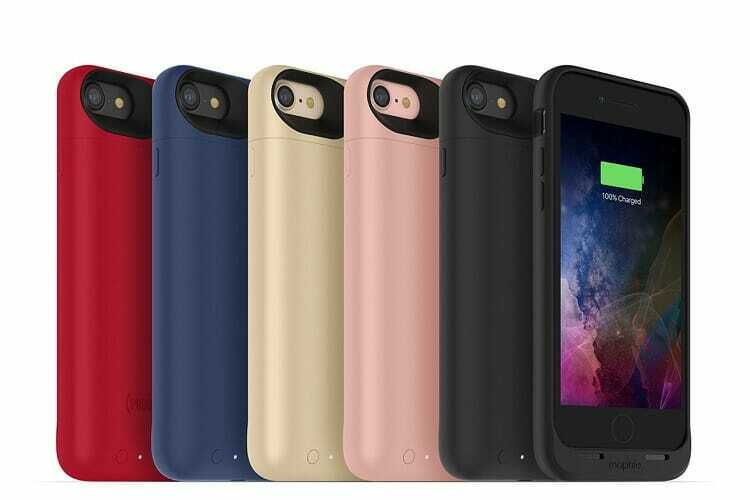 Here are 5 best Battery case for iPhone 7 which you can get from the market. This is one of the battery case which not only adds an extra power but also adds an wireless charging to your iPhone 7. It is compatible with most of the wireless chargers which you can buy separately. Their Charge Force Technology prevents overheating and over-charging of the battery. This case has a 2,525mAh built in battery which can provide up to 100% more battery to your iPhone 7. It has a clean design with minimum branding and also adds front facing speakers to the phone. You can get this battery case in 5 different colors, red being my preferred color. 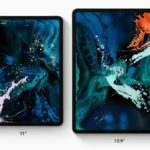 The light-weight battery case features rubberized support pads on the interior for drops and hard falls, and rasied corners for added protection against cracked screens. 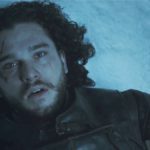 The outer shall is build hard plastic with super smooth finish, which can be little slippery. The only drawback is that it does not support Apple’s wired headphone with lightning connector. 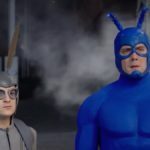 So you have to use a Bluetooth headphones or speaker for hearing the music. It also charges phone and battery with micro USB connector so it will not work with the usual apple charger. The phone will use the micro USB cable to sync with the iTunes as it does all the communication over that only. Apple also understand this problem and sells an official Apple iPhone 7 smart battery case. Coming from apple, this is one of the case which provides much better integration with your accessories. It works with all existing lightning accessories including your headphones and charging cables. It also integrate well with iOS operating system and will show the battery capacity including this case, so you will know exactly how much power is remaining. The case has a silicon based soft touch outer layer with soft micro fiber lining inside to protect your phone. Now because it is coming from Apple, it does not provide extra functionality like wireless charging. It will be a basic case which will add approx 2365 mAh or around extra 26 hours of battery life to your iPhone 7. If you use Apple’s wired headphones and doesn’t care about wireless charging, you may want to take a look at it. The only drawback for this case is its price point, which is little costly. Usually apple doesn’t offer much discount but you can get it with some discount from Amazon. 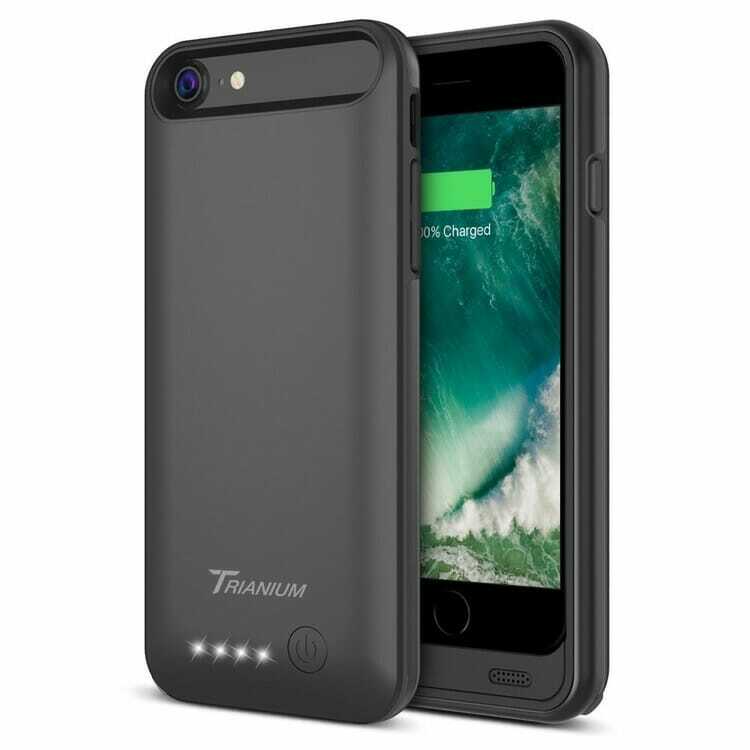 Trianium Atomic Pro is a 3200 mAH battery case for your iPhone 7. It has almost 4.5 star ranking from above 800 customers, which itself talks about its quality. This also has a same drawback as Mophie’s case that its not compatible with lightning port accessories, so you can’t use your wired headphones. You can use Apple AirPods or any other bluetooth headphones. 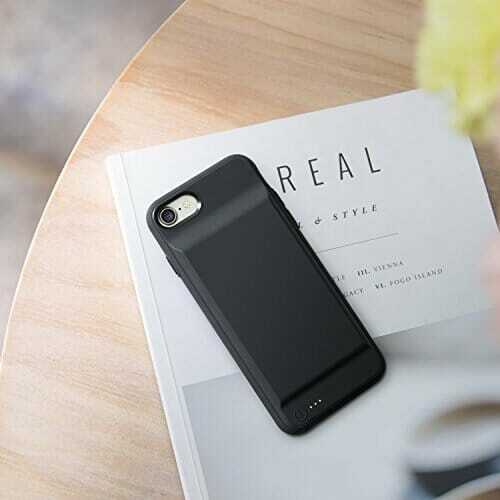 This case has a smooth design at the back, so you won’t see a hump which you see on other cases. It also works with micro USB cable and even sync your phone with that cable only. There is a power button which can let you know how much battery is remaining. The camera lip and front screen has raised borders so they won’t touch the flat surface.It also has soft grip on sides to provide a batter grip with 4 different dual color combos. This is another battery case for iPhone 7 which is MFi Certified from Apple and provide 2750mAH additional power. The case can charge iPhone 7 simultaneously so you don’t need to charge it separately. It also carries the same drawback as others of not using the lightning cable, so if you are not worried about it, it should be fine. It works over micro USB charging cable and allows iPhone sync with it but you might have issues with Apple CarPlay. It’s soft internal lining and tactile silicone exterior provide a premium finish and make phone installation effortless. On the back there are 3 LED power indicator which shows the battery stats and will blink while charging. 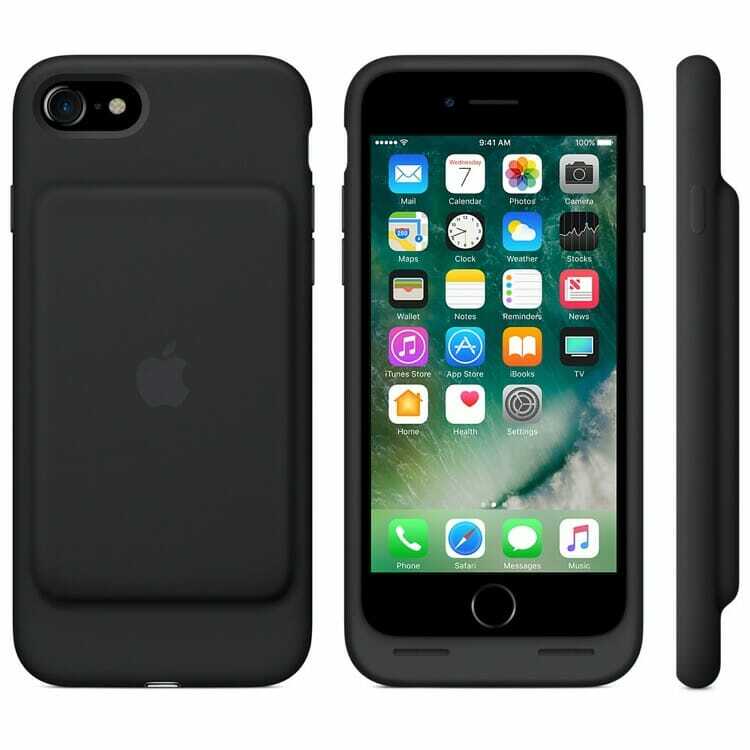 It’s hump on the back is not as big as other iPhone 7 Battery case but doubles the iPhone battery capacity. 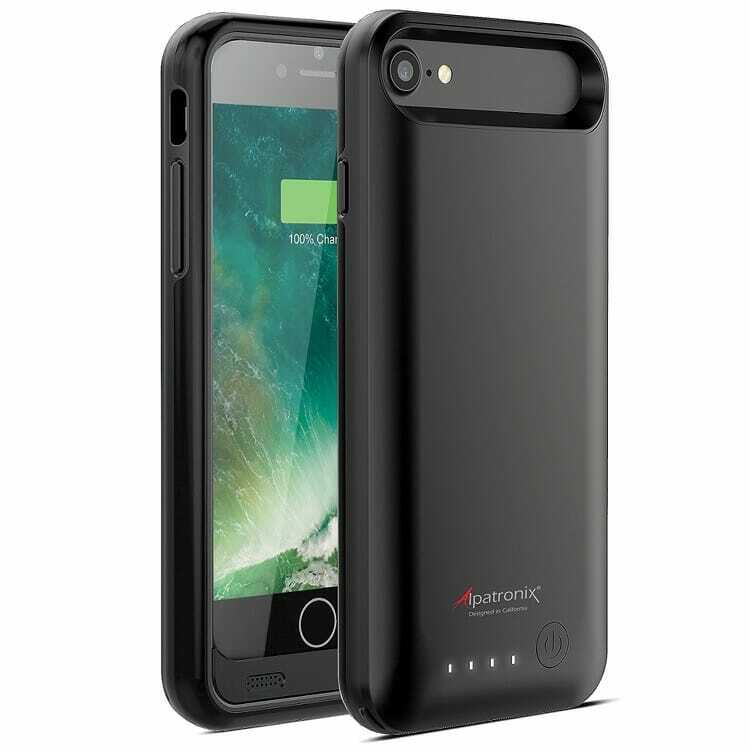 Alpatronix BX120 is a 3200 mAH battery power case for iPhone 7 with a ultra slim design. It adds the extra power to the phone with minimal thickness and doesn’t have an extra hump on the back. It also has a raised front bumper to provide extra protection for the front screen. This case also works with micro USB cable and will not be compatible with Apple’s lightning cable accessories. It can also sync your iPhone over the micro USB cable so you don’t need to take the case off. This case comes in Black, Gold and Rose Gold color and adds to good looks of iPhone 7. It has a Power LED Indicator on the back and easy access to all ports, switches and buttons. It’s dual layer bumper provides extra protection for the phone in case of any mishaps and it also comes with a screen protector. These are some of the best Battery case for iPhone 7. If you want to use Apple’s lightning accessories, there are not many choices and you have to use Apple’s smart case. 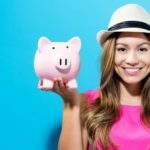 Otherwise there are some good choices available which can do the work in little less cost. Let us know which battery case you use for iPhone 7 and why?